They would even turn and run. And raising hell with their own quad. And leave blue goodness in their face. Wait, I’m getting a little brain-freeze here, so enough with the Rudolph schtick. Here’s the list in numerical order by nomenclature. XV-8 Crisis. Tried and true workhorse. These guys, along with drones and Hammerheads, are one of the Holy Trinity Tau ... That said, even among the trinity Crisis teams are the mainstay of the Tau Battlesuit inventory. 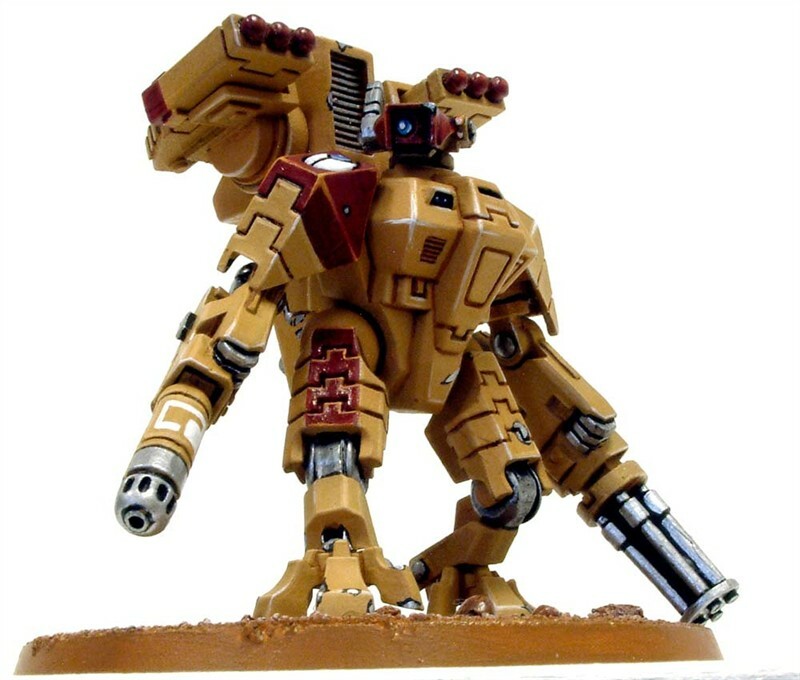 These battlesuits are one of the most flexible units in the entire game with more weapon and wargear options than practically any other unit, and the manuverability to make the most of them. If you're starting new, get plenty of these. You can field up to 15 in a standard, single FOC army. XV-9 Hazard (Forgeworld) These models take the Tau to a new level of bad-assery. I can just see a squad of three laying waste to a huge squad of gaunts, imperial guardsmen, or other vermin. XV-15 Stealth Battlesuit - Old school, but still cool. This is a small battlesuit with minimal armour, it is barely larger than a fully armored FireWarrior, but has the same rules as its XV-25 brother. In fact, they look so similar to firewarriors that presumptious enemies have often mistaken the two... to their peril. XV-22 Experimental Command/Stealth Battlesuit worn by Commander Shadowsun. But it doesn't have to be her. It can be a misogynist’s version of Shadowsun, with the helmet instead of the red flowing hair. 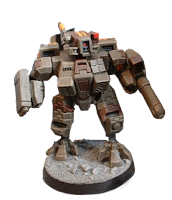 I like to use three of these as the command team in the Apocalypse Rapid Insertion Force or Night Hunter Stealth formations to drop in large groups of battlesuits without scatter. Of course they are “counts as” regular stealth suits, but they looked really cool and these models clearly distinguish them as the command team. We’ll see how these formations fare in the new Apocalypse. 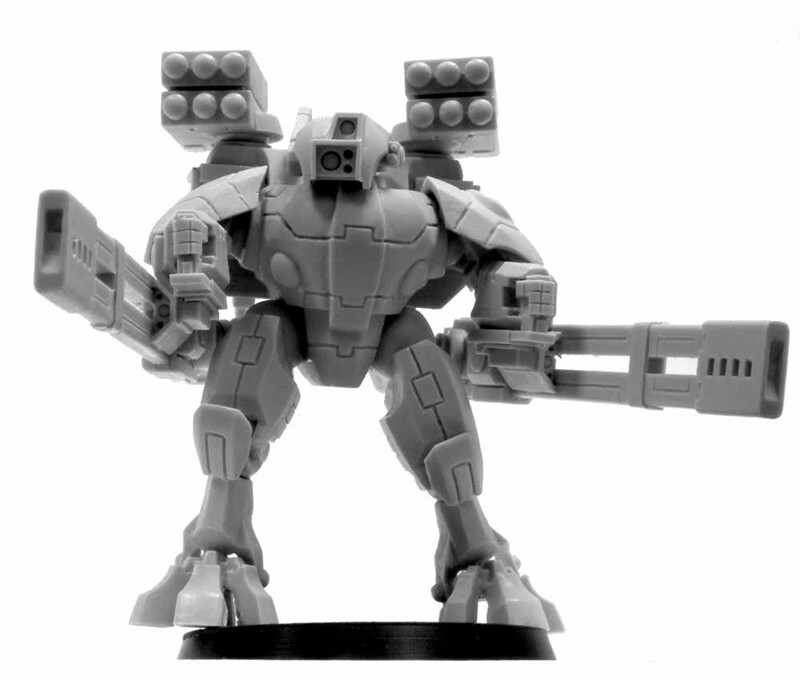 XV-25 Stealth Battlesuit - the standard stealth battlesuit, recently made more awesome by bumping up the burst cannon from three shots to four, and the range of the fusion blaster from 12 inches to 18. Since these are the only two weapons these suits are allowed, they scored on both counts. 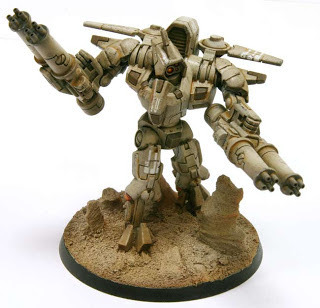 XV-88 Broadsides - I have two, but I want six. Yes, six. Because these guys are that awesome. One squad with rail rifles, and another squad with the high-yield missiles. Broadsides are a must in any army. XV-88 Mark II Broadsides (Forgeworld) - Arguably not much more than a regular old style XV-88, but with a distinctly different design. particularly around the torso. I want two, to slightly remodel as bodyguards for R’myr who has the same smooth contouring and rounded torso/cockpit (I actually like the new broadsides better). The rules now allow you to take iridium armor, so the concept of them looking slightly different from the other battlesuits in your cadre is supported. The extra armor also matches fluff with the armored legs on these guys. XV-104 Riptide - Who doesn't love this thing? It is so much beefier than the Eldar big fella, and you don't need a dead twin to drive it! Uugh, imagine the smell in that thing after a day on a toasty little demon planet... Once again, the Greater Good is just, well, better. 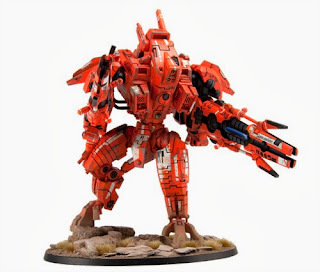 XV-107 - R'Varna - Forgeworld has released a Riptide character, and are calling it the XV-107. 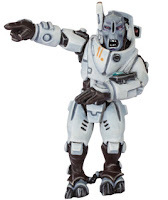 This suit does not have the articulating sensor pod "head" but instead has the sensor suite moulded into the upper cockpit/torso. This variant also carries more powerful versions of R'Alai's weapons. 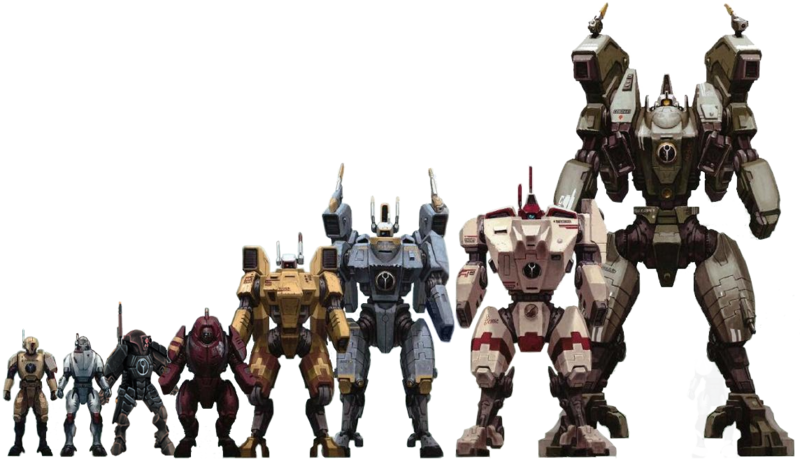 So, call that eighteen, seventeen, fifteen, or sixteen-and-a-half, whatever, it’s still a lot of battlesuits. I have learned that when you get two wargamers together, there will be at least three opinions about everything and anything. I guess I am just a battlesuit kinda guy, and I say it's 17 18. How do you figure 15 battlesuits? 3 squads of 3 + 2 commanders and 2 bodyguards each? Anyway, loved this article. All of yours are great, keep them coming! I think the confusion is that you need to have a specific model for your commander, which is not true. They can all be XV-8s, just one has to be designated as the commander, and he and his body guard have different options and point costs. Same goes with the other HQ choice (which I tend to call the sub-commander). 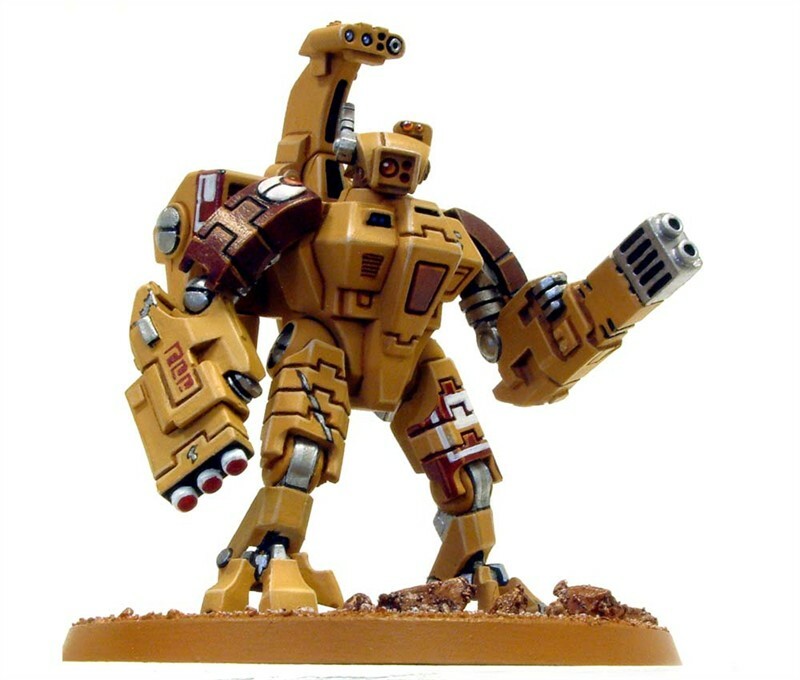 Talking of the XV-88 Mark II's I swear Iridium armour is one model per army? 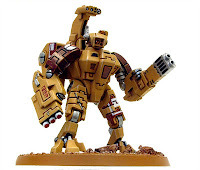 XV-805 is the larger Battlesuit worn by Tau commanders. It has a rounded protected protrusion on the chest to protect the sensor pod "head" and a Tau logo in the center of the torso. It is significantly different from the XV-8 in both size and capability. This is the commander now available from GW. If you look closely at the last pic at the bottom of the post, the XV-805 is the third Battlesuit from the right. The standard XV-8 is the 4th from the right. @Nite Phire, point taken, you are correct that the irridium armor is a signature system that can be only taken once per army. 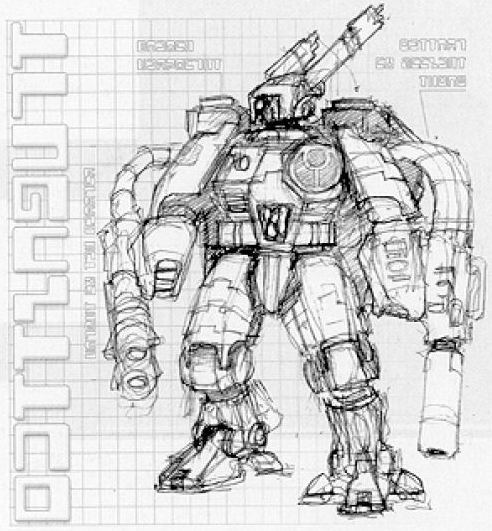 My intended point was that R'Myr can take two XV-89s as body guards, which are effectively the same as irridium armor. Good catch sir, I should have worded that better. How are you getting iridium armour for your broadsides? They are not used as broadsides. They are modeled without their railguns and used as XV-89 bodyguards for R'Myr.